This PDF 1.5 document has been generated by Microsoft® Office Publisher 2007, and has been sent on pdf-archive.com on 18/12/2011 at 06:01, from IP address 173.140.x.x. The current document download page has been viewed 749 times. File size: 1.8 MB (4 pages). to a large crowd of wellwishers, diners and music lovers. and 50 beers in bottles. 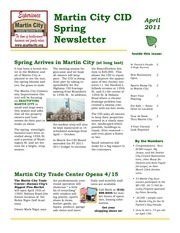 The Martin City Brewing Company (500 E.
beers on tap. and third production for local distribution. a.m. to 1:30 a.m. daily. Oak St. to U.S. Hwy. 150 at $4.3 million. 49th St. are designated HUBZones. 35% who must live in a HUBZone. &quot;principal office&quot; in one of these specially designated areas. distressed areas by providing access to more federal contracting opportunities. 5% of all federal spending must be in HUBZones. www.sba.gov on the Understanding the HUBZone Program page. start to the upgrades of 135th St. .
A bustling, new business at the corner of Holmes Road and 135th St.
Jack Stack BBQ, Wholehouse Flooring and the Martin City Trade Center. in the Tour de Brew Bicycle Tour. a stop for the 2012 ride next May. water stop was the BEST! danger with a deteriorated sidewalk and a sink hole full of fivefoot reeds. to create this remarkable transformation. to keep their property spotless. This file has been shared by a user of PDF Archive. Document ID: 00035860.